Sauté the tomato, pepper, and chopped garlic in the oil. Set aside. Cut the asparagus into small pieces, preferably using the tips for the recipe. Let them boil in a little water with salt until soft. Lightly grease a ceramic container with butter or oil. Cover the bottom with the Serrano ham, then add some of the sautéed tomato, onion, and garlic. Next, add the asparagus, shrimp, and chorizo. Crack the eggs and add to the ceramic container. Bake until the egg whites are completely cooked. Remove from the oven and sprinkle with a little chopped cilantro or parsley. You can add other ingredients to this recipe like cheese, peas, or a little bit of white wine. For many, eggs are synonymous with breakfast. For me, there is no set time to eat them. They're just as delicious any time of the day. Even more so if they're prepared Malaga-style, since they can be served as a delicious entree for lunch or dinner. Just mix some Serrano ham, chorizo (Mexican sausage), a few vegetables, and a delicious blend of herbs and spices. 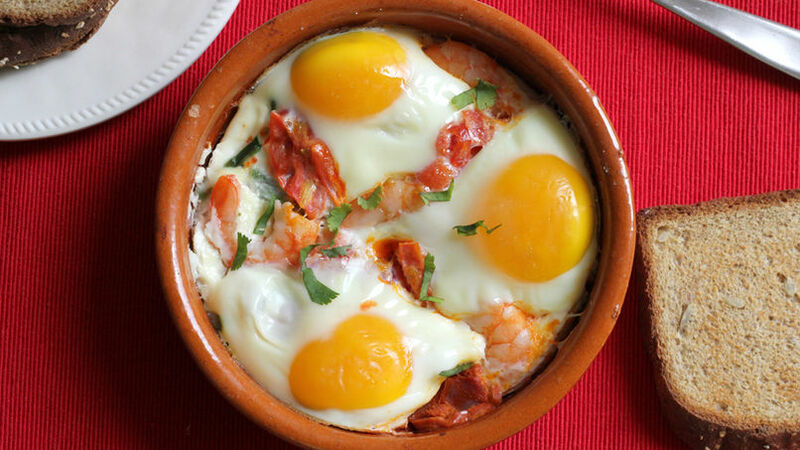 Add the eggs to the same pan, put it in the oven, and in a few minutes, you'll have a delicious meal. Simple, yet exquisite! What time of the day will you serve it?